Mitt Romney: Donald Trump Is a Fraud. He Loves Putin and Knows Nothing About Policy. Sad! Four years ago, Mitt Romney formally welcomed Donald Trump into the Republican Party. The presumptive GOP nominee traveled to Las Vegas to accept the billionaire “birther” theorist’s endorsement, in an apparent effort to capture a larger slice of the “Obama is a Kenyan Muslim” vote. 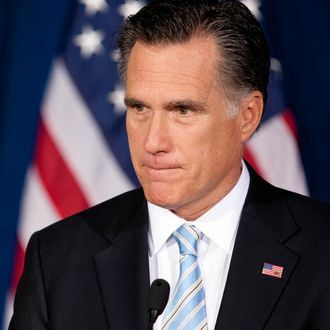 But on Thursday, Romney did everything in his power to evict the Donald from the GOP tent, going so far as to suggest that Trump should be denied the nomination, even if he enters the convention with a plurality of delegates. Romney’s proposed strategy is a recipe for denying Trump a majority of delegates, but would likely leave him with more delegates than any other single candidate. Thus, the former Massachusetts governor appeared to be establishing a rationale for his party to defy the will of Trump’s voters this summer. What’s more, Romney criticized Trump for promising he wouldn’t cut Social Security, a line of attack that’s unlikely to appeal to any Republicans who don’t have summerhouses. Romney a devious genius here, attacking Trump for rejecting all the establishment's least-liked policy ideas, to help Trump win over voters. Romney was on firmer ground when attacking Trump as a failed businessman whose greatest achievement was inheriting his father’s money. Several liberal pundits hailed Romney’s remarks. Which probably means they won’t hurt Trump in the least. But at least Romney was able to reach comedian Rob Delaney.
.@MittRomney I'm sold! I was gonna vote for him, but now I'm not. Because of your good speech.